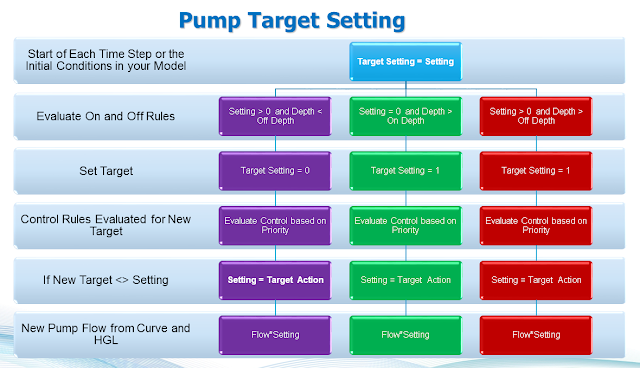 How does the Pump Target setting in #SWMM5 work? Your pump options, include the initial conditions, the pump on and off depths, the pump type, the pump curve and optional real time rules or RTC Rules. Red is the situation if you start with the Pump with the Wet Well depth greater than the Pump Off Depth. The Pump Setting is greater than zero and the depth is greater than the Pump Off Depth – the pump never turns off. You need start the pump in the off condition.Purple and Green is the situation when you start the model with the Pump Off. The Pump then turns on based on the Pump On depth and off based on the Wet Well depth and the Pump off depth. 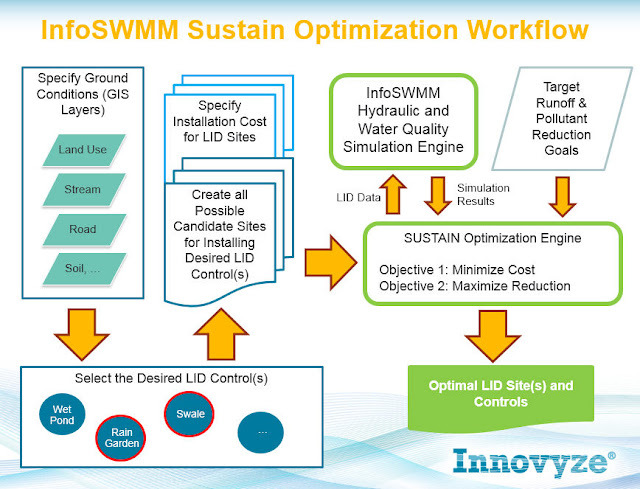 See below for the important list of InfoSWMM versions and EPA SWMM 5 engines. Figure 1 shows how the SWMM5 data is shown in both the Database of InfoSWMM and the Map of Arc GIS. You see the data on the map and you can edit the data in the Attribute Browser (AB) and DB Editor. 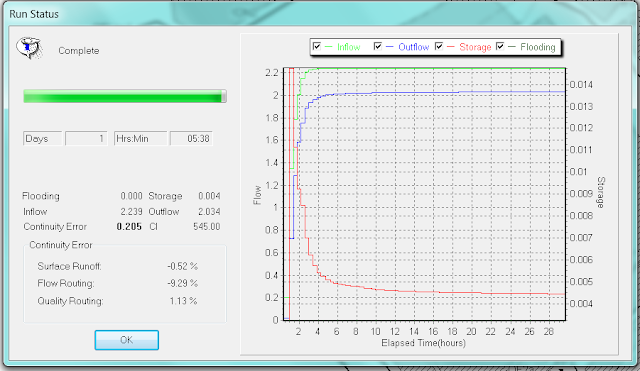 This is from a working QA/QC version of SWMM 5.022 showing some feedback from the Simulation Run to the User’s Run Status dialog: You can see the total inflow, outflow, storage and flooding in a graph and text box in the Run Status dialogYou can see a running estimate of the Continuity Error (CE) andIt stays on the screen when the run as finished.The following images show some examples. 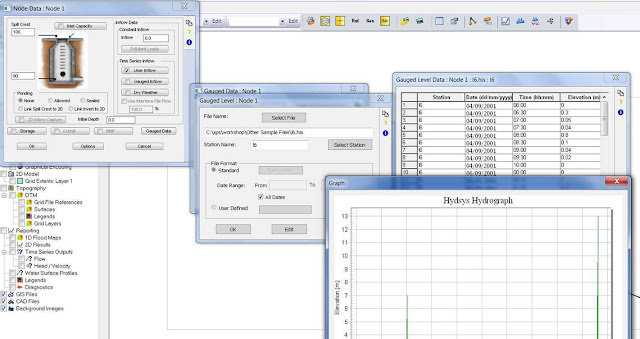 Note: Editing and Graphing Gauged Data in XPSWMM for Runoff Nodes, Hydraulic Nodes and Links. Here is a sample of the data. In a world that increasingly asks us to move faster, and do more to be effective we need better ways to do our analysis. One of the hardest tasks we have is to quantify the difference between our simuluation engines. 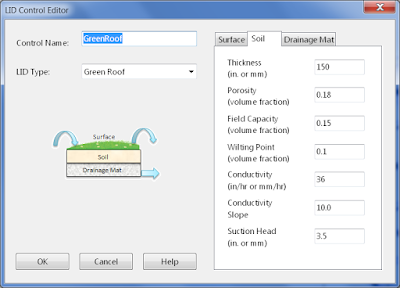 All of our Sewer and Storm software are hyper complex with interconnected options for all elements in the network. One way to help with these comparisons are graphs using the calibration files of SWMM5, InfoSWMM, InfoSWMM SA and XP-SWMM. 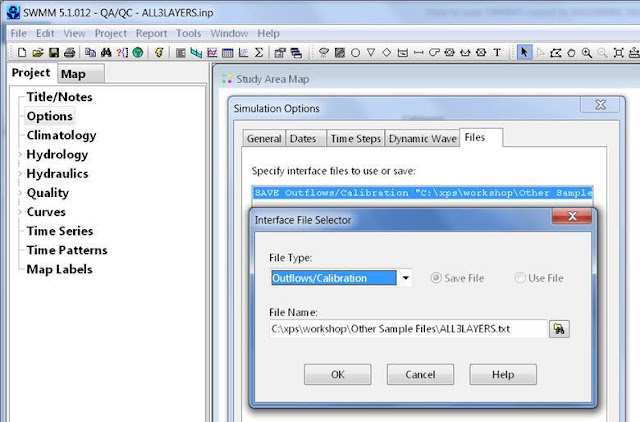 The remainder of this blog describes the steps in using a QA/QC version of SWMM 5.1.012 to make these calibration files. It is a wish list for me at least.. This completes the full set of reference manuals for SWMM 5 that also includes Volume I (Hydrology) and Volume III (Water Quality and LID). We hope that these manuals allow SWMM users to gain a better understanding of the computational methods and techniques used by the program. 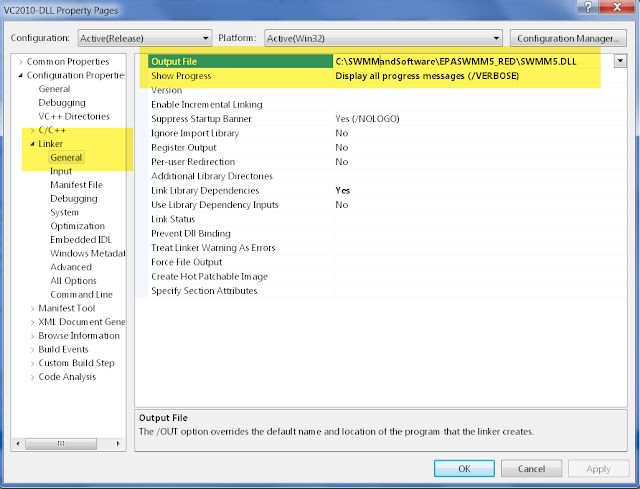 The routine readNewIfaceValues reads a line interface flows in SWMM5. It is a string parser, finds tokens and creates dates, times and flows from the tokens. It is important to have the correct format for your line else the tokens will not be correctly converted to integers and doubles. 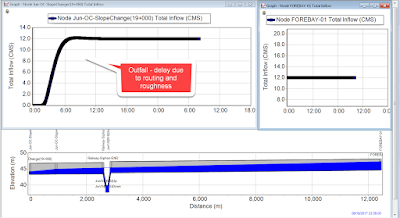 Further, it is important to have more than one date/time for each node as the SWMM5 engine interpolates the flow values for each node during the simulation. One time value or time values out of the simulation date/times will result in no flows.